Idle Evolution presents an innovative idle clicker title, with a fresh sprinkling of science for those who desire to create a world replete with an innumerable amount of atoms (Idle’s currency). It first appeared on websites such as Newgrounds and Kongregate (with over a million plays on each ), but has now made its way to the Steam platform, with added features that make it well worth the astonishingly low price of five dollars. Clickers do tend to be free, but entail microtransactions. 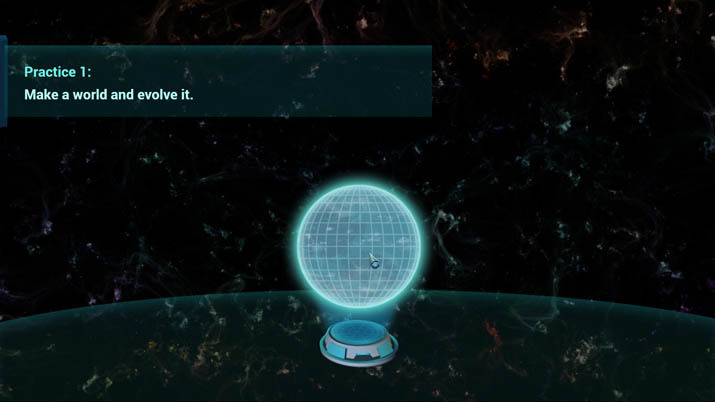 There are three difficulties, the last of which you unlock once you beat the game; note that you cannot change the difficulty once chosen, but you have five save slots. The second difficulty, Chemist, gives you no scientific assistance whatsoever, while the first mode (Normal) does. Once you start, the screen appears rather blank, showing mostly the vastness of empty space. But, helpful tips appear, along with a mission system that serves as a basic guide. Often, idle clicker titles are rather straightforward, so I am pleased that the game presents this tutorial, given that, for the first few seconds, I was searching for what to do and how to progress. But, once you get the hang of what to do, a sense of unfamiliarity that might result in unease ceases, though perhaps not entirely: you must still accustom to such an unfamiliar interface. Additionally, you have to hover over the upgrade tab to see which-elements-are-where on the developing periodic table, and how many atoms you have of each. Is it worth taking the time and effort to familiarize yourself with such an unfamiliar interface? Yes, and I realized this once I unlocked a new zone and could extract atoms other than just hydrogen; a universe with just one type of atom is a lonely one indeed. You use extractors to extract atoms from a particular element. 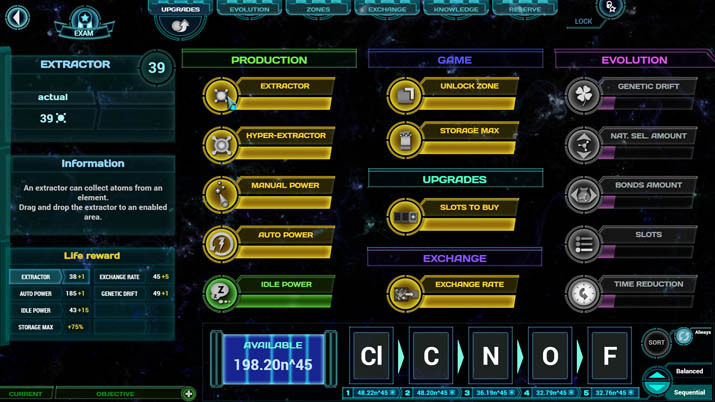 You may purchase more extractors using these atoms, or various upgrades, such as the power of these extractors or your “clicker,” or purchase additional tabs that add depth — for example, there's one that allows you to invest atoms into production boosts for an entire zone, such as noble gases or alkali metals. ...a sort of ‘sweet, stuff is evolving’ aesthetic. Shortly after, you’ll come across planet earth, which has a timed request. There isn’t anything “failable” about this; rather, it acts more of what the planet “requests,” whether it be water, ammonia, or some other compound. After this timer ticks to zero, the needed compound will change. You can perform a chemical bond (to create the requested compound) once you have the required amount of atoms. (With a particular upgrade, you can have more compounds available to chemically bond.) Water, since it is two atoms of hydrogen and one of oxygen, you’ll need 2M of the former, and 1M of the latter. The exact amounts will vary, as you can change this in the evolution tab’s settings, but the proportion of 2:1 for this compound remains the same. Doing this grants you evolution points, which are used to get a planet to one-hundred percent on its stage–completing the planet stage–at which point you select one of two rewards. After completing one stage, I could choose that some living beings develop an appendix. I mean, why not, right? Unsure of its purpose, or why I would choose it (I chose it anyway) since it has a decent tendency to burst, but let’s let those living beings worry about this. Sometimes, a mutation will result on the planet, or a rare gene will appear, but these do not seem to affect anything, but rather exist as a sort of ‘sweet, stuff is evolving’ aesthetic. I would, however, like to know more about what has mutated, and the ensuing results. 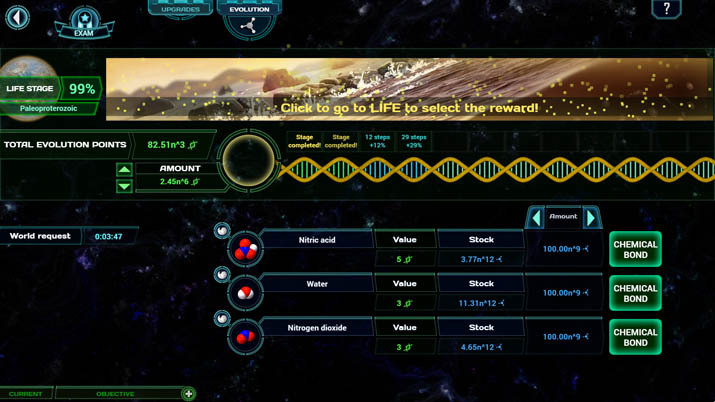 Completing missions offer XP, which will level you up and grant access to new stages; hence, Idle Evolution is a tad linear, as you cannot progress to the next planet stage until you complete missions and consequently level up. Some require you to rearrange the formation of your extractors, which can become tedious, but at least you are permitted to save your current arrangement and reload that at a later time. 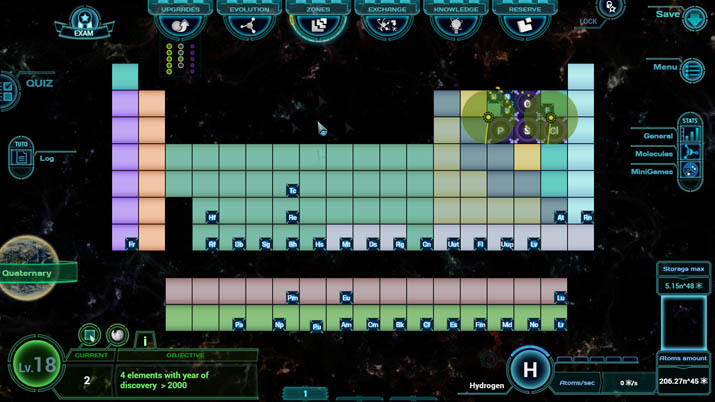 When leveling, you’ll face a mini pop-quiz, such as, “what elements make up the compound water?”. Don’t worry if you place your answer on the wrong element, as you may change your selections until correct. Once correct, some bar that surrounds the numerical value of your current level increases; once you fill this entirely, you “clinch” the level, and thereby your level increases (assuming you’ve completed enough missions and gained enough XP to level) and you unlock the next planet’s stage. Note, you do not have to complete these mini pop-quizzes only when “clinching” the level, but rather at any time, so long as the question is there. I recommend completing these while waiting for enough atoms to purchase upgrades and the like, so that when you do gain enough XP, your level will simultaneously increase. The stat system is exquisitely thorough, but slightly deceiving: instead of displaying how many molecules of a particular compound you’ve sold thus far, it shows how many times you’ve sold that molecule. This method does make some sense, since when you continue purchasing upgrades, it becomes much easier to produce large amounts of a given compound at once — there is a certain risk of inflation if it were to show how many times you’ve produced that compound. Additionally, there are times in which the wording, of a mission, for instance, seems odd, but, this does not detract much from enjoyability. It just might require some messing around with your extractors, or some other feature, to ascertain what you’re supposed to do. To not write on how this release affects the genre of idle clickers henceforth is to not do justice to Idle Evolution. Previously, I have only seen this genre produce dating sims such as Crush Crush, or RPG-styled entries such as Clicker Heroes. Never before have I witnessed a game within this genre deviate from this well-known path — there may very well be something that does stray from being a dating sim or RPG idler, such AdVenture Capitalist, but that does not feature as much depth as Idle Evolution. It’s hard to tell for sure, as there are countless titles out there. But, of what Steam offers with the tag “clicker,” nearly all are one of these two types. I’ll mention Voodoo Garden, for its unique art style, but I’ve yet to play that one. Of course, there might be titles somewhat similar to Idle Evolution — the internet is a vast place — but, the popularity of this one makes it quite influential. Moreover, Idle Evolution centers itself completely around chemistry and, to a lesser but still relevant extent, topics such as evolution, and it implements these topics superbly, while also being educational: it provides information about various elements found in nature, such as their melting points or electronegativity value. The title offers quizzes that center around chemistry and its history as a discipline, although these quizzes are, unfortunately, not always available to attempt and they are short, offering five questions. Is a knowledge of Chemistry required? No, but it certainly comes in handy, given these quizzes and the objectives of certain missions. Later on, you can unlock a “reserve” tab for a certain amount of atoms where you may purchase upgrades (using atoms you’ve banked in your reserve), such as decreasing time before another quiz appears. You can pick a temporary boost from these quizzes, and the strength of this boost depends on how many questions you answered correctly. You can also play minigames — rarer than the quizzes — which result in a permanent and cumulative increase in production for particular elements depending on how well you do on these. Another great innovation: finally, someone developed an idler that does not require you to click until carpal tunnel nearly sets in. Rather, hovering your cursor over an element on-screen acts as your clicker. The developers have saved my mouse pad’s left click button, along with my finger. I’ve yet to see any of these features implemented into an idle clicker game. Idle Evolution takes a novel look at how one can develop an idle clickers, and implements the concept exceptionally well. This release also sets the stage for future idle titles, and sets the bar rather high; Idle Evolution arguably heralds the dawn of a new era for this genre. If you are looking for an idler that doesn't play as passively as a good portion of the ones already out there, or one that incorporates a subject of study and centers itself around it, then Idle Evolution is a must-have.